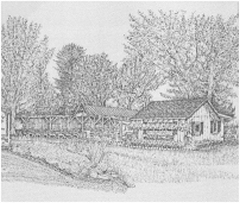 In, 1934, Westfield Perennial Garden was opened on the Westfield-Sherman Road in Westfield, New York. Owners Roy R. and Frances M. Bentley moved their family and business to West Main Road (it's current location) in 1935. The name was then changed to Westfield Nursery and Garden Shop. Charley and Nancy (Bentley) Hanks took over the business in 1981 and purchased their first dump truck in 1984, which is still being used today. Today, the Company is owned and operated by Scott and Laurie Robbins, who purchased Westfield Nursery and Garden Shop in 1991. The Company is now known as Westfield Nursery, Inc. and is operated with the same quality of knowledge and service which began with Mr. and Mrs. Bentley in the early 1930's. We are all saddened by the loss of Charley Hanks. Charley passed away on November 23, 2007. He was a familiar face at the Nursery every season helping out wherever he was needed as he greatly loved the business. Charley was a wonderful, caring man and he will certainly be missed. ©Copyright Westfield Nursery 2019. All rights reserved.